The GeoSpeed 100 paper system is the answer for those who want a fast and easy-to-operate system that provides exceptionally flexible and eco-friendly crumpled paper packing material. This on demand system is easy to operate and generates Kraft paper packaging that is perfect for packing products which require absorption or temperature insulation. The crumpled paper packing is fully biodegradable and recyclable, and is the perfect solution for packing objects with sharp corners that could pierce other forms of packing material. Pregis’ Kraft paper packaging system delivers crumpled, recyclable, renewable and biodegradable Kraft paper packaging at variable speeds of up to 70 inches per second! 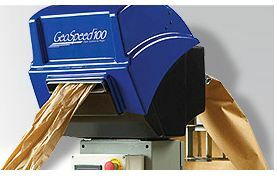 The GeoSpeed patented design produces tightly crumpled paper packing that is great for void-fill, cushioning, wrapping or blocking and bracing. The GeoSpeed packaging machine is loaded with user-friendly features to help optimize your packaging operations. The crumpled paper packing can be dispensed in custom lengths, or set the system to deliver continuous high beam strength Kraft paper packaging that is excellent for void-fill, cushioning, wrapping or blocking and bracing. Fast. The GeoSpeed™ system produces up to 70 inches of material per second. Unmistakable, environmentally-friendly appeal. Crumpled paper packing material is recyclable, renewable and biodegradable. Operator-friendly. Easy to program visual controls and foot pedal make operation easy. Unique loading feature. Patented roller loading system enables safe and easy loading. Versatile. The GeoSpeed™ Kraft paper packaging system dispenses custom lengths or continuous on-demand, high beam strength packaging that is excellent for void-fill, cushioning, wrapping or blocking and bracing. tightly crumpled cushions used for a broad array of packaging applications.